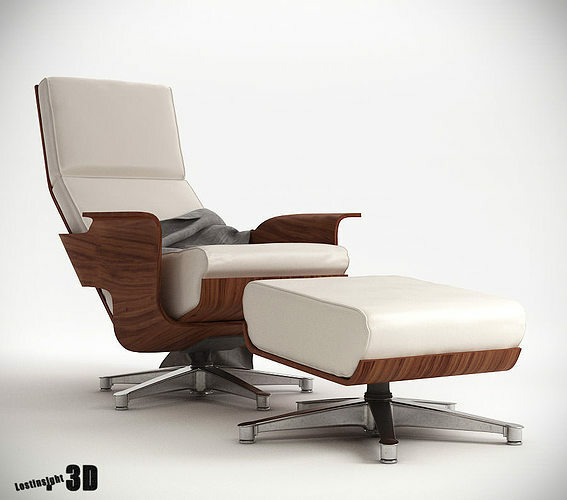 -The Chaise Cuatro by Ricardo Garza Marcos is a beautiful chair inspired by the 1956 Eames Lounge Chair. The frame is made from three bent plywood pieces which hold a set of leather cushions. Overall a modern furniture lover dream comes true! -What's inside: High Quality 3D model and detailed enough for close up renders with a Real world size of 88cm-width X 119cm-length X 104cm-height, very good design and shape and a realistic vray materials for 2 types of Wood surface texture’s. Plus a dropped cloth model with the studio set-up and HDRI. This model is ready to be imported into your scene. -3D software use: 3DsMax-2010 for basic modeling and further improved with autodesk mudbox. -Compatible with 3dsmax 2009 UP to the current verion and vray 1.5 UP to the current version.